Dual-core design with an integral partition for medium to big game. Federal Premium, .270 Winchester, Nosler Partition, NP, 150 Grain, 20 Rounds is rated 4.8 out of 5 by 9. Rated 5 out of 5 by Dano101 from Performance Your target will not wander off after taking a hit from this load, I would think any game within 350 yards is in the freezer. Dan. Rated 5 out of 5 by Otadanorth from Works for elk too I have shot 7 elk with this ammo and it knock then all down quickly, which is very important in the mountains where we hunt. I tried other ammo and it does not compare. This is the only one that hits hard enough to trust in these hunting conditions and situations. It is also the most accurate that I have found. What an unbeatable combination. Sportsman's Guide has the best prices I have found on it. 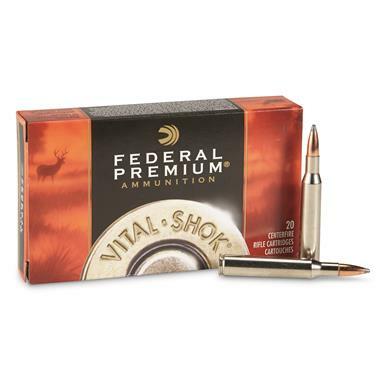 Rated 5 out of 5 by mountainman from Federal Premium 150 NP I think this is some of the best ammo on the market. I've been using it for years on whitetail deer. Sportsman's Guide has absolutely the best price on this ammo. It is the only place I purchase it. It will put whitetail deer to sleep. Rated 5 out of 5 by huntermike9 from BLOOD TRAIL :-) I love my .270. It is flat and I do not really shoot super long range. I've killed plenty of deer and was looking for a bullet with a little better blood trail. I shot an 8 point and the exit hole was the same as having a huge broadhead. The bullet is very accurate and the deer will not go far. The best I've used in a .270. Clean your boots after you find your deer. Rated 5 out of 5 by DAVID from Found exactly the ammo I needed at a better price at SPORTSMANGUIDE. THANKS!! Rated 5 out of 5 by TODD from they are the best!